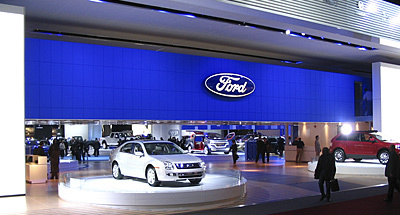 Aluminum Supply Company provided nearly all of the metal for these Ford Motor Company displays, including extruded aluminum, aluminum sheets, and an assortment of steel products. ASCO supplied everything from very small bars used for decorative floor inlays to large structural beams and channels that form the entire supporting structure for the displays. 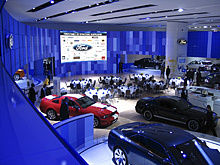 These Ford displays premiered at Detroit’s North American International Auto	Show and have since been seen all across the country at various other auto showcases. ASCO’s ability to provide large quantities of material very quickly, often within a few hours, was crucial to the progress of this project. Our willingness to conform to tight scheduling constraints is key for this industry, as the manufacturers are often required to build very intricate displays in a very limited amount of time.